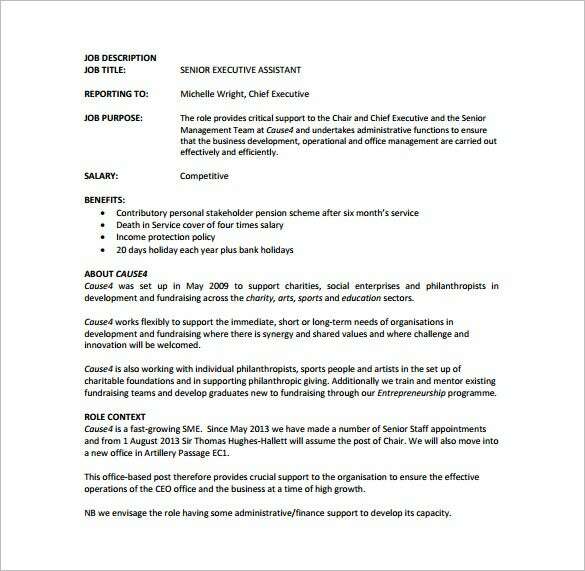 cause4.co.uk | Senior Executive Assistant Job Description, which is free PDF template, describes in details the job requirements and purpose such as to contribute accurate support to the senior management team like the Chief Executive, making certain that the office management, operations and business development performed smoothly and productively. It also includes the benefits after completing 6 months in the organization. 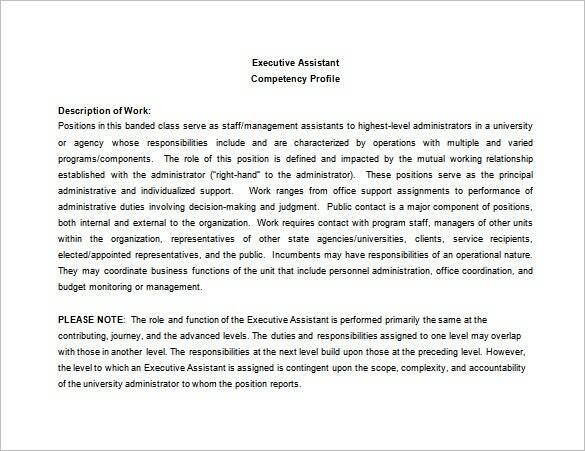 ncsu.edu | Executive Assistant Job Description Word format is available for free download. 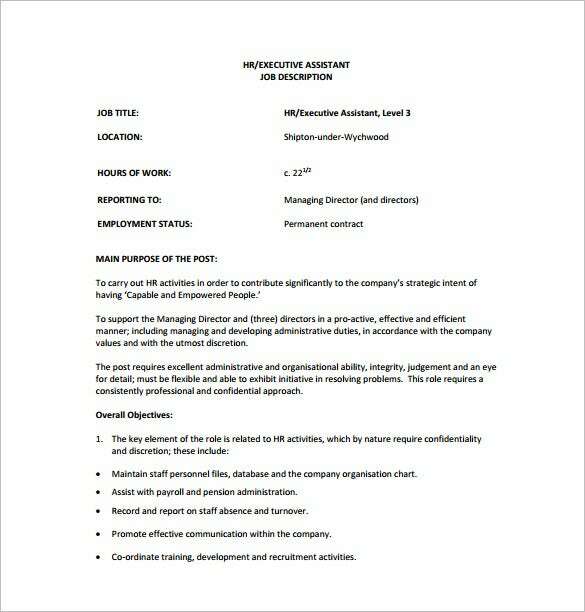 In this template, you will find that it clearly given the description of the work to be met by the executive assistant. 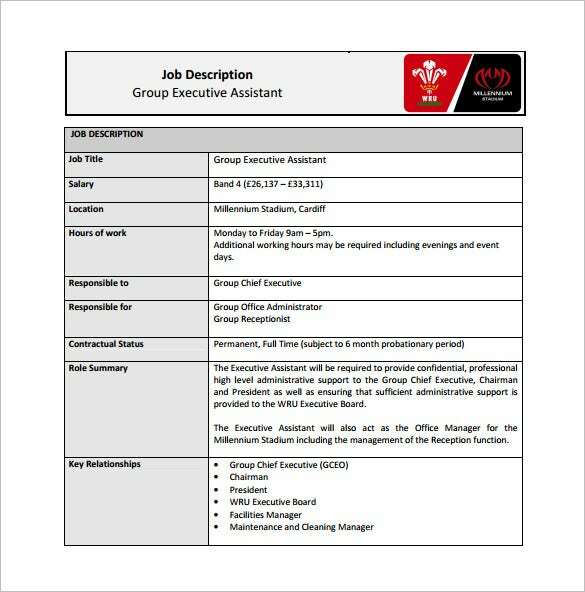 The role includes being an assistant to the administrator as well, apart from representing the Executive in meetings, and supporting office assignments. 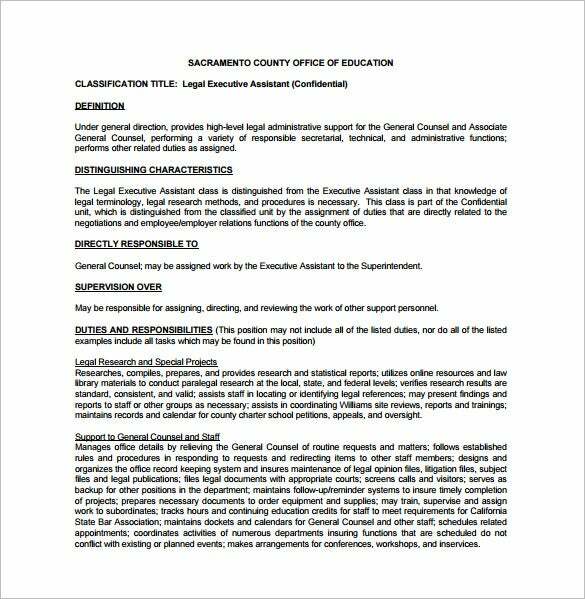 scoe.net | Legal Executive Assistant Job Description PDF template as the name suggests has to do with very important legal administration, supporting the administrative duties and looking after the responsibility as a secretarial role. The profile also includes of giving support to General Counsel and staff, dealing with legal research and special projects for the organization. 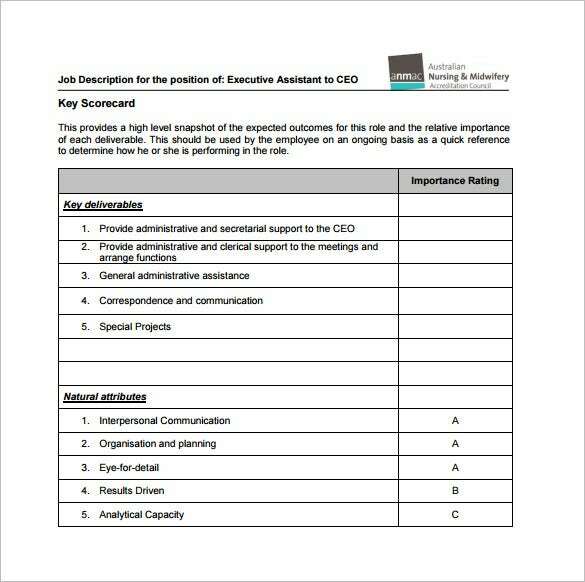 anmac.org.au | Executive Assistant to CEO Job Description PDF Template is very helpful, as you have to hire that someone who can deliver high-level responsibilities and tasks. Here, it includes important duties to carry such as provide secretarial, clerical and administration support to the CEO, meetings and arranging events and functions, communications and corresponding. 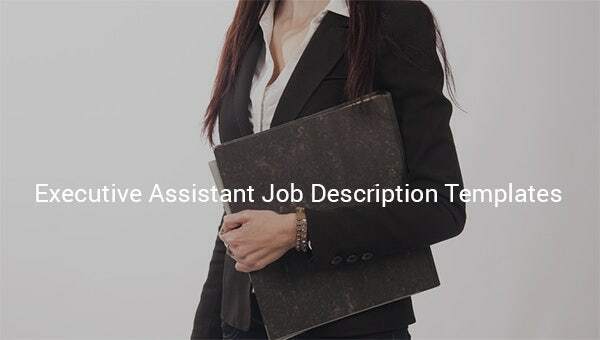 What are the top Uses of Executive Assistant Job Description Templates? 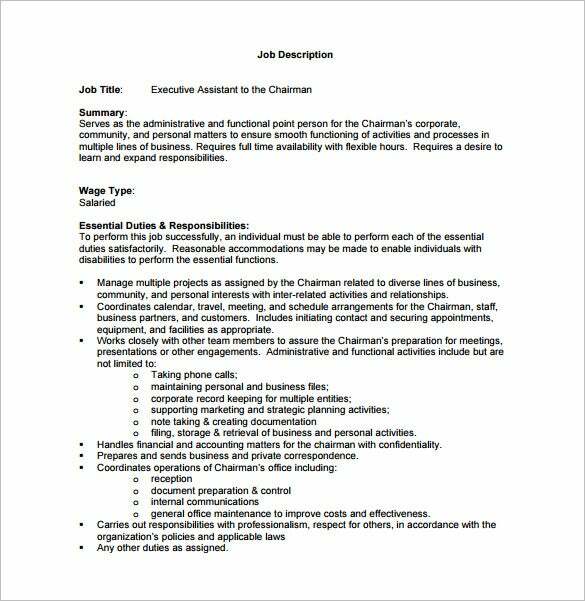 Executive Assistant Job Description templates are useful as they include all the important key job responsibilities, tasks, duties to perform effectively mentioned clearly. They provide in details the information that required by you for those candidates fit for the job. The job description is not like any other ordinary jobs as the role is TO PLAY like the backbone of the CEO, managing the smooth running of the office, arranging meetings, even representing the executive during absence.With the help of the sample template, you can directly post on jobsites or your official website or edit , add and modify in case if the need arises. 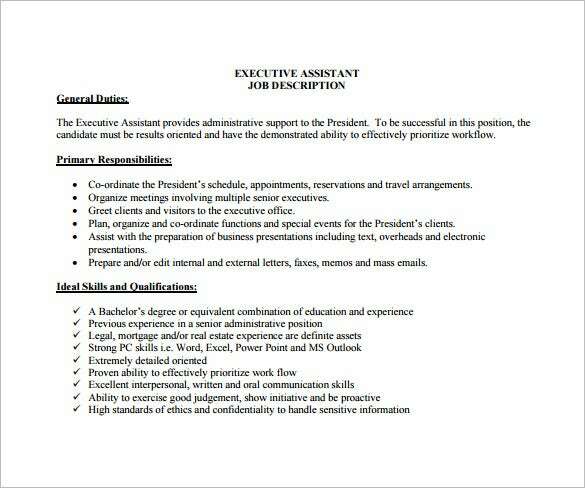 Who all can use Executive Assistant Job Description Templates? Executive Assistant Job Description Templates are most useful to all the corporate organizations, business houses to help hire the perfect person who can be the right perfect assistant to the CEO. With the details provided in the template, there is no doubt that it will take you to the right crowd to a large extend, thus giving you the highest chance of hiring the best from among the best.It describes in brief all the responsibilities and roles of the candidate for the required job. That way the candidates know what they are walking into without having to get surprised later. What are the Benefits of Using Executive Assistant Job Description Templates? There are multiple layers of benefits when you talk about Executive Assistant Job Description Templates. The templates are optimized in such way that you can post them in online job platforms and your company website. By doing so, you save your valuable time and money, and you can have the freedom, and concentration and attention to other important part of your profile.You can also customize the template according to your requirements by adding, editing more details of the description of the roles and job. Such template also makes the candidate understand the job clearly, the tasks, roles and responsibilities.